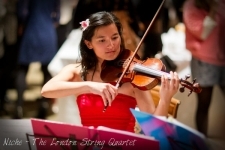 Niche String Quartet, Trio & Duo have played wedding music and provided wedding entertainment at many of the world’s favourite London Wedding Venues! Whether you require wedding entertainment for the ceremony, drinks reception, wedding breakfast – or all three, Niche London Wedding String Quartet will make sure you have the perfect musical accompaniment to your special day. Niche London String Quartet are highly experienced and will time your entrance and exit music perfectly having impeccable judgment during ceremonies, so you can be free of worrying about the details on the day. We have traditional classical wedding ceremony favourites, and a huge list of up-to-date modern chart hits to chose from! Plus songs from musicals, films and jazz allow us to cater perfectly for literally all tastes and styles. We would be delighted to discuss the choice of music in advance, and give helpful advice to ensure that your wedding is both memorable and unique. The most common format for wedding entertainment is as follows but we can play for as long as you want and where you want too! Wedding music before the ceremony, as the guests arrive. Ceremony begins with entrance music – during which Niche Quartet performs a specially selected piece of wedding music. Signing of the register – Niche Quartet play appropriate wedding background music or specially selected wedding songs. Exit of the happy couple – a lively piece of wedding music specially selected by the couple for their exit. Music as photos are taken, and throughout drinks reception. Music for part or all of the wedding breakfast. Find out what our previous wedding entertainment clients have said about Niche Quartet’s work here. Niche is happy to travel to another venue if needed. We will tailor the music to create the perfect atmosphere for celebration and sophistication! As a wedding quartet we often play outdoors during the drinks reception, but some of our instruments are 200 years old or more, and need to be sheltered from direct sunlight. In the event of rain we would need to move indoors. We also provide a highly unique wedding music service where you and your guests can even get involved with the music as we provide a live requests show! We’ll provide the list and your guests get to choose whatever they want to hear – Like a live, interactive jukebox you will have the chance to have four musicians play your every request. It doesn’t get much more bespoke than Niche playing the soundtrack to your day! Just ask for The Niche Quartet Jukebox when booking.